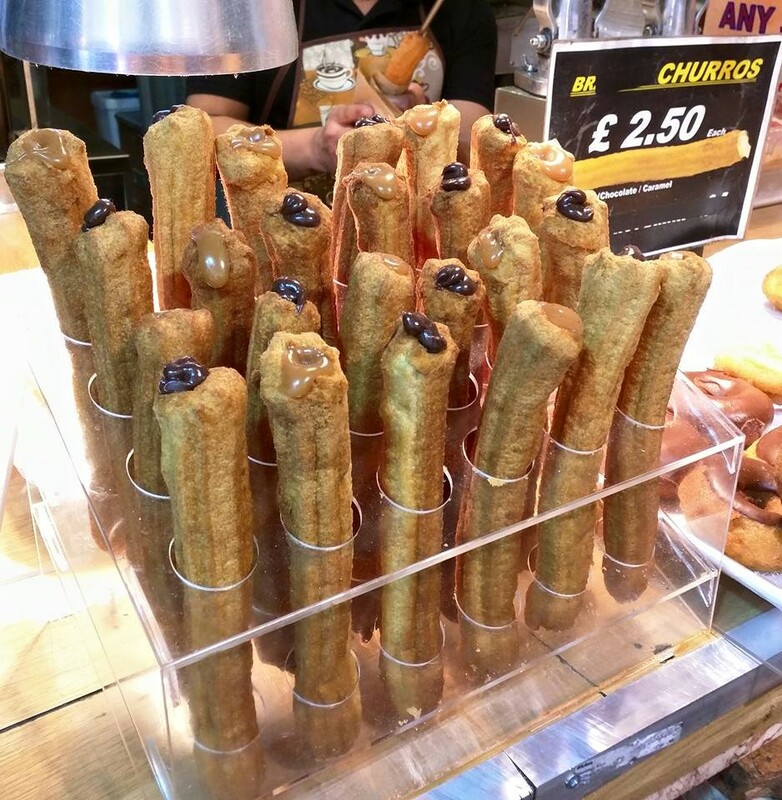 Restaurants, food markets, and bars galore, London is indeed a true foodie paradise. In fact, the abundance of tasty treats also means that there is no shortage of “London top places to eat lists”. The question now is, where do you start? In lieu of listing out the top 100, 50 or even the top 20, I’ll make things simple for you: I’ll offer you my FOUR gems! 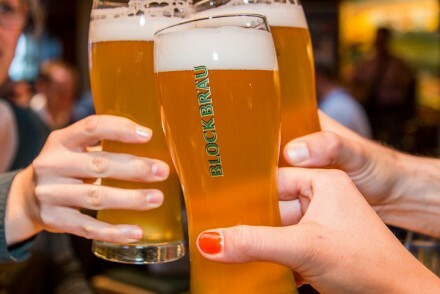 All locations feature innovative cocktails, mouth-watering street foods, the best selection of craft and London beers, and plenty of space to eat and mingle. Korean Burritos? Check. Fried Chicken Waffle Sliders? Check. Lobster rolls? Check. Hot Doughnut Bites with Salted Caramel Ice Cream? Oh heck yes check! There are even a variety of cocktail bars and dance rooms with featured beverages, music and decor to align with the room’s theme. If you’re a whiskey fanatic then pay The Whiskey Bar at Hawker House a visit to try one (or a few) of the 50 featured whiskies. Or get your dance moves on in Model Market’s Winyl room, an 80s disco and 90s hip hop dedicated all-vinyl wine bar. When the sun sets and it starts to get cold, the fire drums are lit to keep you warm and toasty. 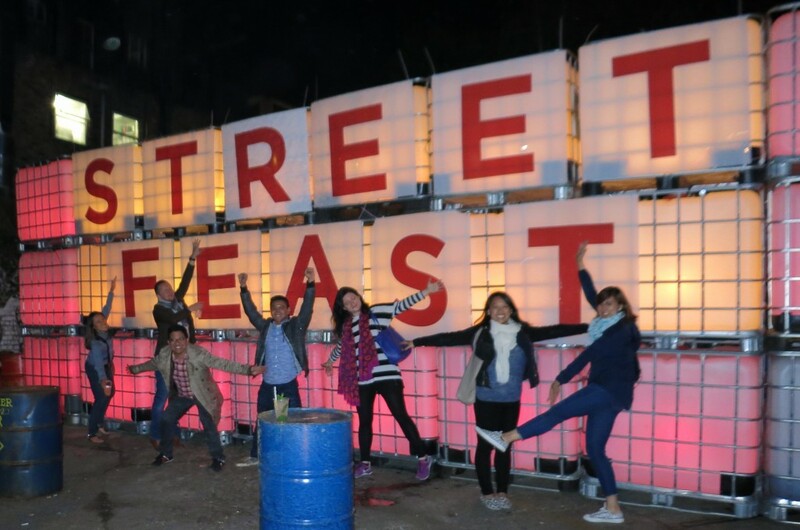 Not only does Street Feast offer up some of the best gastronomic experiences, it’s also a place to have fun and party. 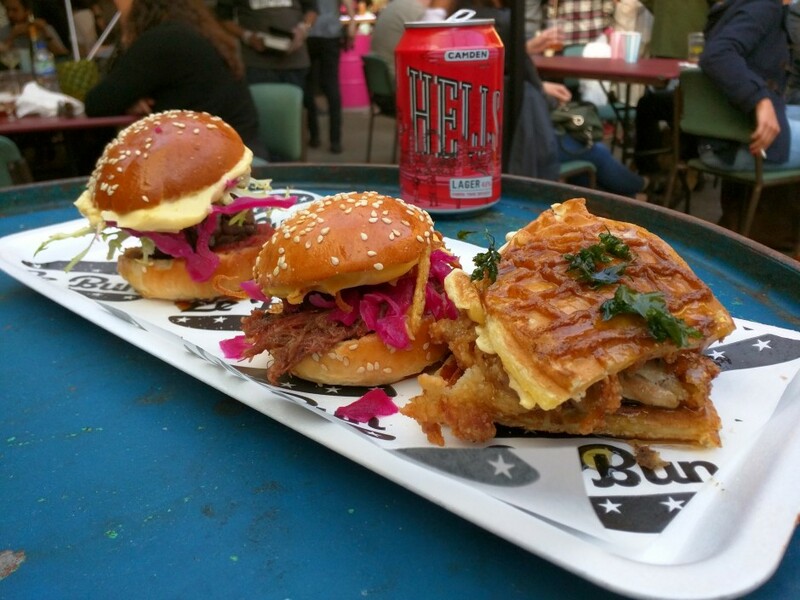 Tip: Street Feast is only open during the spring and summer season at the Dinerama and Model Market locations. Hawker House location is open all year round. Arrive early (before 7pm) to avoid the £3 cover charge. The hustle and bustle of Camden Lock Market makes it an ideal place to wander, get lost, people watch, and find just about any trinket you’ve ever wanted (or not wanted). And of course eat! There are four main market areas: Buck Street Market, Lock Market, Canal Market, and Stables Market. The variety of stalls from each of these markets blend together – from jewelry and clothing to tasty eats and knick knacks. You’ll get dizzy from the colors, sounds, and energy. The food stalls are located primarily at the Lock Market and the Stables Market. Here, you’ll find the world on a plate; everything from Spanish Paella and Turkish Kebabs to Taiwanese Bubble Tea and warm chocolate filled churros. There’s something for everyone. 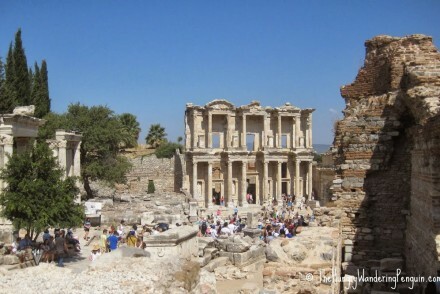 Tip: If you don’t like crowds avoid visiting on weekends. Instead, go later in the afternoon during the week. While in the area, be sure to visit the Regent’s Canal, which runs through Camden. I might be biased here since duck and waffles are two of my favorite foods, but Duck and Waffle truly is awesomeness for the taste buds. 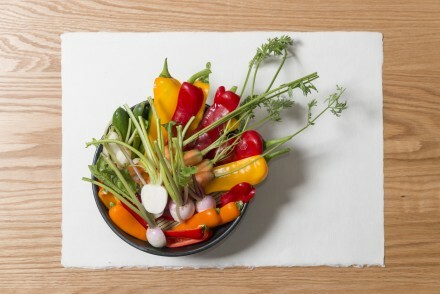 The restaurant boasts a Modern European cuisine with a twist. Every dish, from the signature duck and waffles to the bacon wrapped dates or foie gras crème brûlée, offers an explosion of amazing taste sensations that leave you dreaming for more. Not only is the food and beverage experience one-of-a-kind, but the restaurant, located on the 40th floor of the Heron building, also offers some of the most spectacular views of the city. That’s why the restaurant, which only accepts reservations 2 months in advance, is constantly booked up. 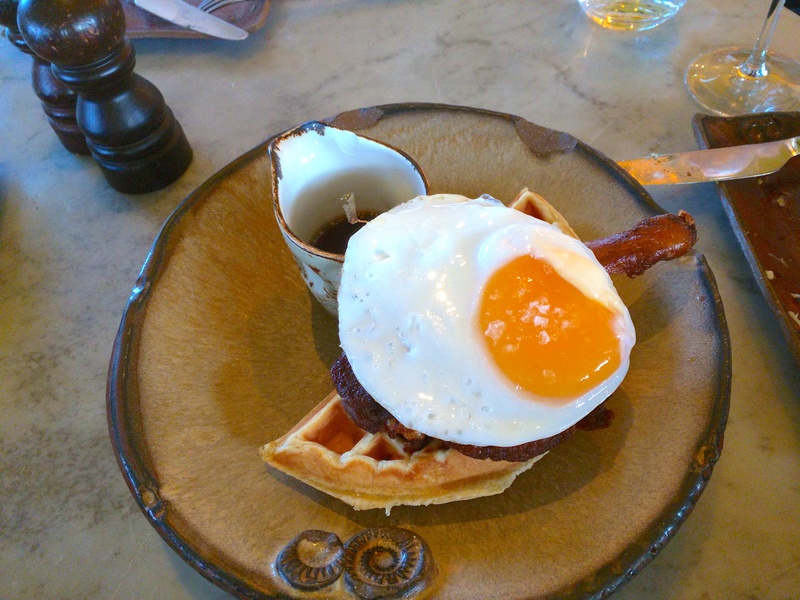 Thank goodness you can get your Duck and Waffle fix at any hour of the day. Breakfast service starts at 6am and late night service goes until 5am. There’s also an all day menu of limited items in case you arrive between 5am – 6am. Your chances of getting seated are higher in the whee hours of the night! Tip: Arrive before your dinner to enjoy a drink from the ever-changing artisanal cocktail list at the bar. Then sit back and absorb the stunning views of the sun setting over the city sky line. When your table is ready and it’s time for dinner, be sure to order the signature duck & waffle–a dish that should not to be missed! After all, it’s the name of the restaurant! Alternatively, you can arrive at 5am for a view of the sunrise! Looking for a quintessentially English experience? Look no further. Afternoon tea at the Library Lounge in the London Marriott Hotel County Hall is an absolutely divine experience that should not be missed. The old world charm of the lounge, with bookshelves piled high with books and adorned with plush decor, offers a stunning view of the Big Ben and the Houses of Parliament. On the menu is a nice selection of exceptional teas, freshly baked scones, cakes and pastries as well as a twist on traditional finger sandwiches such as the London Dry Gin Cured Salmon and Caper butter sandwich. My favorite are the scones topped with a bit of the strawberry jam. Absolutely divine! 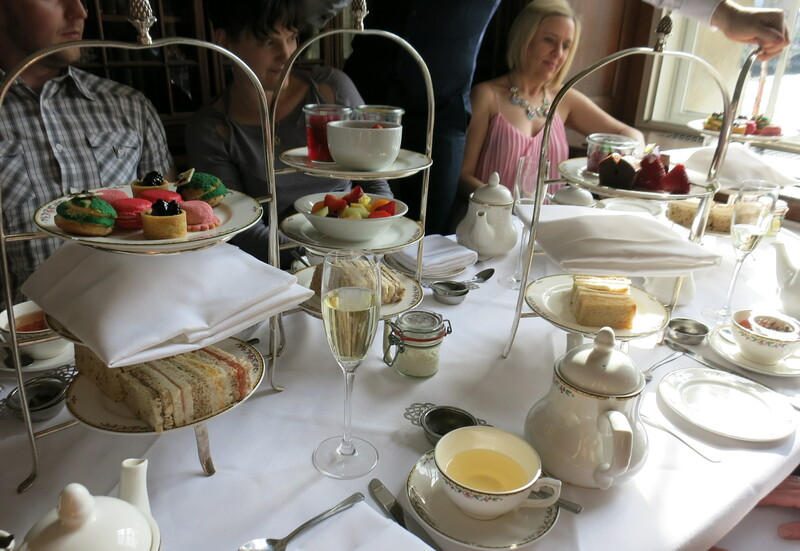 Bonus: You can add unlimited bubblies to go along with your afternoon tea! Tip: Tables can be booked up as far as 4 weeks so be sure to make advance reservations! Request a window table, which will offer a fantastic view overlooking the Thames. Then spend a few hours relaxing, munching, and enjoying the company of good friends into the whee hours of the afternoon.